Yahoo! UK and Ireland have launched a handy new mobile search service which allows consumers to check the prices of goods via Yahoo! WAP services when they’re out and about. 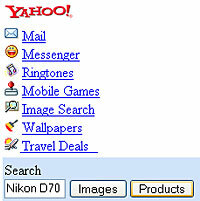 The service, accessible on all WAP enabled phones at standard browsing rates, serves up instant price and product information from the Yahoo-owned comparison service Kelkoo. Yahoo! said it will not charge for the service which promises to cover 3 million product offers and more than 5000 UK retailers. Mobile users accessing the WAP site at http://wap.yahoo.co.uk, can type in their desired product into the search box and click on the “Products” button. A result screen then displays images, pricing and product information, providing users with the low down about the cheapest prices around. It all sounds great, but we found the service a little flaky. At the first two attempts, we got a screen of results serving up nothing more than the price and the name of the shop with no location, address, phone number or Weblink. A fat lot of good, then. However, if you persevere and click through to the next results page, a ‘compare’ link should magically appear under some products and this will let you access its full details. Once the service is fully ironed out, shopkeepers around the UK can prepare to brace themselves for a stream of tech-savvy bargain hunters waving their WAP phones around the counter and demanding price matching.